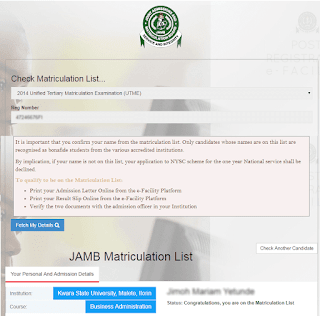 JAMB PRE-REGISTRATION TIPS FOR UTME 2017. 2. Candidates are expected to have a valid email address.This will be used to create individual profiles on the portal. 3. Candidates Please request to have a personal profile created for you. DO NOT allow the centres to use their profiles for you. You can create your 2017 UTME profile on jamb.org.ng It is a free service. Don’t be swindled. 5. Candidates with awaiting results will be allowed to register as it was being done. They will not be uploading any result. 6. Candidates now have the option of selecting different exam years and exam type when combining their O’Level results. 7. Candidates now have the option of choosing two 1st Degree institution, and any two of ND, NCE or IEI. 8. Candidates can also make their choices to be four IEI or 3 NCE and 1 of ND or Degree. 9. There will be no sales of scratch cards for the registration. Mode of payment will be communicated to you soon. 10. Cyber cafés will not be allowed to render services on behalf of JAMB. So please visit ONLY JAMB accredited centres. JAMB will provide simplified steps to ease registration to the public soon. This promises to be a seamless exercise.